Chanakya was born in Brahmin family. Chanakya known as Kautliya also . Chanakya's birthplace is a matter of controversy, and there are multiple theories about his origin. According to the Buddhist text Mahavamsa Tika, his birthplace was Taxila. The Jain scriptures, such as Adbidhana Chintamani, mention him as a Dramila, implying that he was a native of South India.According to the Jain writer Hemachandra's Pariśiṣṭaparva, Chanakya was born in the Canaka village of the Golla region, to a Brahmin named Canin and his wife Canesvari.Other sources mention his father's name as Chanak and state that Chanakya's name derives from his father's name. 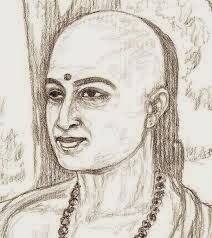 According to some sources, Chanakya was a brahmin from North India, scholar in Vedas, and a devotee of Vishnu. According to Jain accounts he became Jain in old age like Chandragupta Maurya. At a very early age little Chanakya started studying Vedas. The Vedas; considered to be the toughest scriptures to study were completely studied and memorized by Chanakya in his infancy. He was attracted to studies in politics. In politics Chanakya’s acumen and shrewdness was visible right from childhood. He was a student of politics right from child hood. Known as a masterful political strategist, He knew how to put his own people in the opposite camp and spy the enemy without his knowledge before destroying him forever. Chanakya was an ace in turning tables in his favor irrespective of the circumstances. He never budged to pressure tactics by the ruthless politicians. In this way after studying religion and politics, he turned his attention to economics, which remained his lifelong friend. "Nitishastra", a treatise on the ideal way of life shows his in depth study of the Indian way of lifeHe was a professor (acharya) of political science at the Takshashila University and later the Prime Minister of the Emperor Chandragupta Maurya. He is regarded as one of the earliest known political thinkers, economists and king-makers. He was the man to envision the first Indian empire by unification of the then numerous kingdoms in the Indian sub-continent and provide the impetus for fights against the Greek conqueror Alexander. Chanakya is perhaps less well known outside India compared to other social and political philosophers of the world like Confucius and Machiavelli. His foresight and wide knowledge coupled with politics of expediency helped found the mighty Mauryan Empire in India. He compiled his political ideas into the 'Arthashastra', one of the world's earliest treatises on political thought and social order. His ideas remain popular to this day in India. In Jawaharlal Nehru's "Discovery of India", Chanakya has been called the Indian Machiavelli. Three books are attributed to Chanakya: Arthashastra, Nitishastra and Chanakya Niti. Arthashastra (literally 'the Science of Material Gain' in Sanskrit) is arguably the first systematic book on economics. It discusses monetary and fiscal policies, welfare, international relations, and war strategies in details. Many of his nitis or policies have been compiled under the book title Chanakya Niti. Niti shastra is a treatise on the ideal way of life, and shows Chanakya's in depth study of the Indian way of life. According to a legend, while Chanakya served as the Prime Minister of Chandragupta Maurya, he started adding small amounts of poison in Chandragupta's food so that he would get used to it. The aim of this was to prevent the Emperor from being poisoned by enemies. One day the queen, Durdha, shared the food with the Emperor while she was pregnant. Since she was not used to eating poisoned food, she died. Chanakya decided that the baby should not die; hence he cut open the belly of the queen and took out the baby. A drop (bindu in Sanskrit) of poison had passed to the baby's head, and hence Chanakya named him Bindusara. Bindusara would go on to become a great king and to father the greatest Mauryan Emperor since Chandragupta - Asoka. When Bindusara became a youth, Chandragupta gave up the throne and followed the Jain saint Bhadrabahu to present day Karnataka and settled in a place known as Sravana Belagola. He lived as an ascetic for some years and died of voluntary starvation according to Jain tradition. Chanakya meanwhile stayed as the Prime Minister of Bindusara. Bindusara also had a minister named Subandhu who did not like Chanakya. One day he told Bindusara that Chanakya was responsible for the murder of his mother. Bindusara asked the nurses who confirmed this story and he became very angry with Chanakya. It is said that Chanakya, on hearing that the Emperor was angry with him, thought that anyway he was at the end of his life. He donated all his wealth to the poor, widows and orphans and sat on a dung heap, prepared to die by total abstinence from food and drink. Bindusara meanwhile heard the full story of his birth from the nurses and rushed to beg forgiveness of Chanakya. But Chanakya would not relent. Bindusara went back and vent his fury on Subandhu, who asked for time to beg for forgiveness from Chanakya. Subandhu, who still hated Chanakya, wanted to make sure that Chanakya did not return to the city. So he arranged for a ceremony of respect, but unnoticed by anyone, slipped a smoldering charcoal ember inside the dung heap. Aided by the wind, the dung heap swiftly caught fire, and the man behind the Mauryan Empire and the author of Arthashastra was burned to death. His main philosophy was "A debt should be paid off till the last penny; An enemy should be destroyed without a trace". He seemed to have lived - and died - by his philosopy.a paradigm shift. It has also emphasized the need for original and path breaking legal research to create new legal knowledge and ideas that will help meet these new challenges in a manner responsive to the needs of the country and ideals and goals of our Constitution.